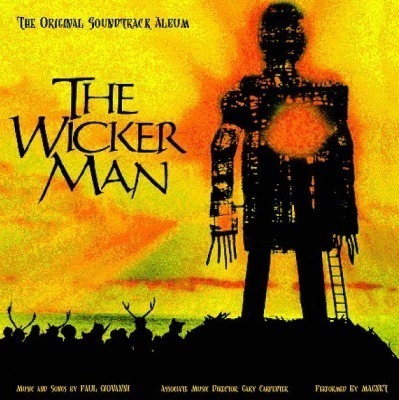 In any case, The Wicker Man is a stunning soundtrack. Paul Giovanni, together with Magnet, uses flutes, lyres, harmonicas, and guitars in a mixture of original and traditional material to create a mysterious and sinister world that comes to life apart from the film. Long thought buried somewhere under the M3 along with prints of the full version of the film, this release represents a truly wondrous piece of archaeology. In most cases any film labelled 'cult' tends to use the label as a get-out clause for some wobbly production that had something to do with Russ Meyer. The Wicker Man was always much more than this. From, probably, the last period when British cinema was prepared to show more than gritty portraits of life 'up north' or sappy feelgood nonsense about Hugh Grant living in a ridiculously large apartment in London, The Wicker Man dared to combine a genuinely creepy story line about provincial paganism with a simply stunning collection of songs. Despite its trouble with the distributors the film has now been rightly placed in the pantheon of great celluloid, and its soundtrack deserves the same accolades. Ironically the saviour of this sonic scariness was the other übermensch of cult movies, Roger Corman. Found within his private collection of film prints, Paul Giovanni's songs reside neatly against a portrait of the idyllic community of Summerisle whose adherence to an older order attracts the unwanted attentions of uptight Presbyterian policeman Edward Woodward. American Giovanni collected a fine bunch of sessioneers under the banner of Magnet and conjured up some surprisingly authentic-sounding folk numbers. The lilting (how come folk is always lilting?) melodies of numbers like ''Corn Rigs'', ''Gently Johnny'' and ''Willow's Song'' are stuffed with a vaguely sinister eroticism, reflecting Woodward's unease as he scratches the tranquil surface of the island community to discover its sinister secret (you know, the usual: child sacrifice, fertility rituals, Britt Ekland rubbing up against a wall etc.). Christopher Lee (the Laird of Summerisle and, himself, a vocalist on the bawdy ''The Tinker Of Rye'') described this album as:''...quite extraordinary, it is probably the best music I've ever heard in a film''. He's not far short of the truth. Maybe it takes a foreigner to get to the dark heart of much of our indigenous music, but it's a darkness suffused with beauty. Coupled to the original incidental music - complete with snippets of dialogue, including Woodward's terrified shriek as the full weight of realisation hits him ! - this is a vital document of a time when the UK could still produce classic cinema. It's also a really fine album.